Irish genealogy special offers come in all shapes and sizes and are announced to coincide with traditional festivals (St Patrick's Day/Christmas, for example) and at steady intervals throughout the year. 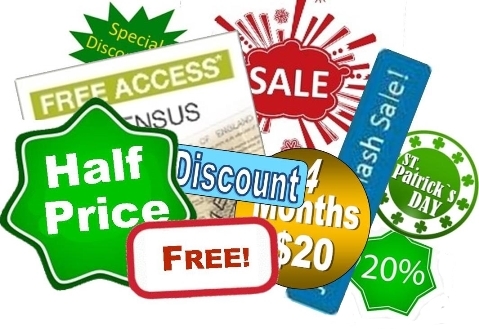 This page of Irish Genealogy Toolkit is updated regularly, so be sure to bookmark it if you want to be certain of picking up a bargain and keeping the cost of your ancestral search under control. 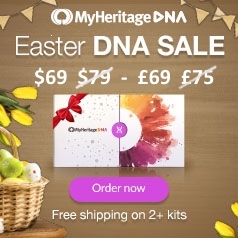 My Heritage is holding an Easter Sale on both sides of the Atlantic on its home testing autosomal DNA kit. The savings are not huge (around the 10% mark) but always worthwhile, and possibly the best we'll see until summer or Thanksgiving. You can also boost your saving by taking advantage of the free shipping offer. For researchers in Ireland and UK, the sale reduces the price of the MyHeritage DNA kit from £75 to £69. If you choose to order two or more kits at the same time, you'll receive free shipping. For USA researchers, the sale reduces the price of the MyHeritage DNA kit from $79 to $69. As in the UK offer, if you order two or more kits, you won't be charged for shipping. Discounts will expire on Easter Monday, 22 April. There may be similar discounts available in Canada, Australia/New Zealand and other territories. Unfortunately, I can't locate details. If you're not in Ireland, UK or USA, click the image above to reach your local MyHeritage territory to see if it is offering a sale. 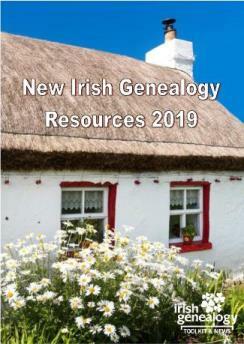 Irish Roots, Ireland's only independent genealogy magazine, has a great gift idea for the genealogist in your life (or treat yourself... go on, you know you deserve it). 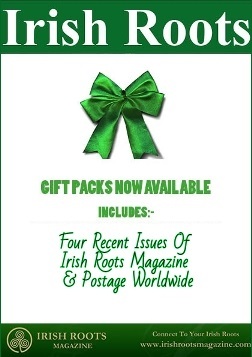 It's a Gift Pack of four recent issues of the quarterly magazine, bringing you advice on traditional family history research and genetic genealogy; guidance on finding resources for specific areas of Ireland, and on themed collections in the USA and Australia; details of newly released or enhanced record-sets; news and comment from Irish genealogy and local history groups; as well as Q&As and news of developments relating to Irish genealogy. In other words, it's a useful and informative read for Irish genealogists of all levels of experience. Prices start from just €25 (within Ireland). Outside of Ireland, prices are UK £25; USA $30; Canada $38; Australia $40. On the order page, you can click switch currency to find your preferred local currency price. The prices quoted here include worldwide postage and packing costs. Ireland's 'newspaper of record', The Irish Times has a special offer for overseas readers. It gives 50% off the price of either the Standard or Premium digital subscription package for a period of three months. Thereafter, you can either cancel the subscription or pay the regular price. Both packages provide full access to IrishTimes.com (non-subscribers get access to only a handful of articles a week), to subscriber-only articles, special offers and the Crossword Club. The Premium subscription additionally gives you The ePaper, a digital copy of the print edition. Importantly for Irish family historians, both these packages give full access to the Irish Times Archive, which includes all editions published since the paper first appeared in 1859. The regular price of the Standard package is £10, €12, US$12. The discount reduces the cost to £5, €6, US$6. The regular price of the Premium package is £12, €16, US$18. With the discount, the cost is £6, €8, US$9. To find out more about the discount and the content of both packages, click the image. 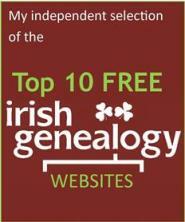 Keen to start researching your Irish heritage and genealogy? Jump straight in at the Get Started page. You can also boost your saving by taking up the free shipping offer. Irish Roots, Ireland's only independent genealogy magazine, has a great gift idea for the genealogist in your life (or treat yourself... go on, you deserve it). In other words, it's a useful and informative read for Irish genealogists of all levels of experience. It's also a truly thoughtful Christmas pressie that shows how much you care. Both packages provide full access to the IrishTimes.com website (non-subscribers get access to only a handful of articles a week), to subscriber-only articles, special offers and the paper's Crossword Club. The Premium subscription additionally brings you The ePaper, a digital copy of the print edition. Discover which Irish records burned, and which survived, and how this may impact your Irish family history research.